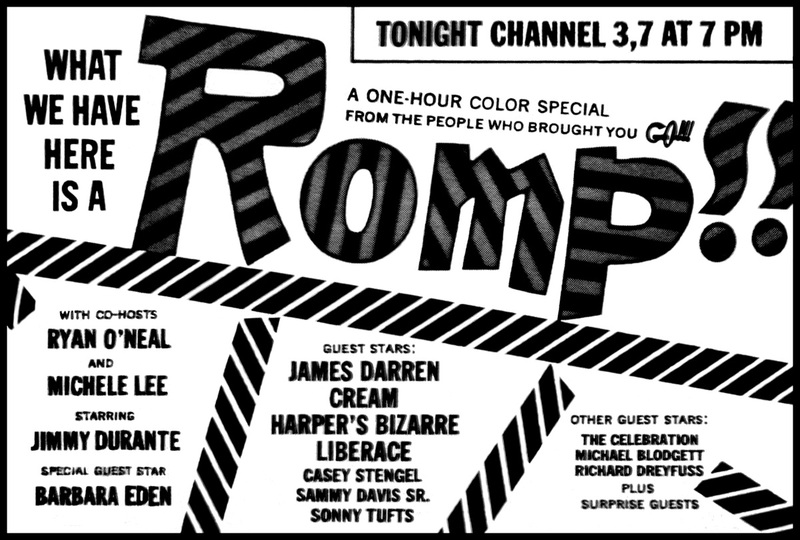 Telecast by ABC-TV on April 21, 1968 (and preempting VOYAGE TO THE BOTTOM OF THE SEA, dammit!) 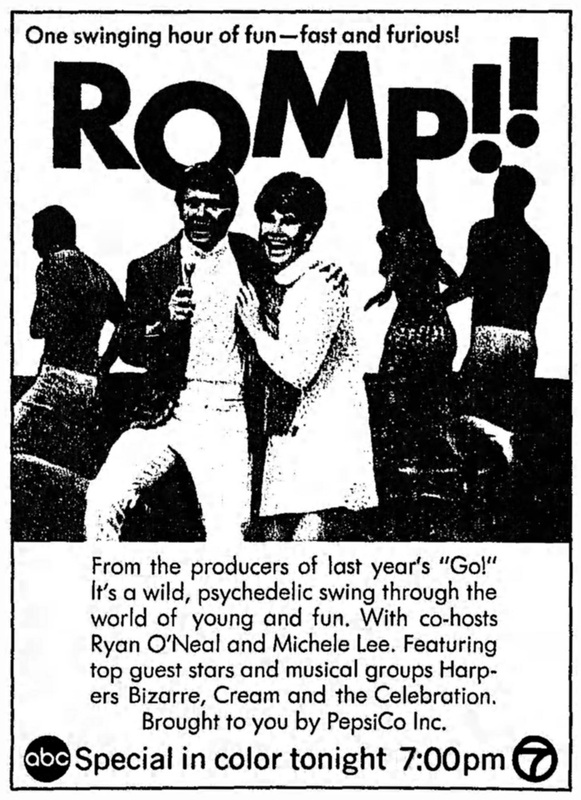 and sponsored by Pepsi, this follow-up to 1967's GO!!! was a "psychedelic hour of fun" that mixed the kitsch value of a typically-arbitrary, all-star television-special with the ill-conceived corporate notion of what attracted the young counterculture generation. Written by (LAUGH-IN writer and future GONG SHOW producer) Chris Bearde, (future LAVERNE & SHIRLEY co-star and The Credibility Gap member) David L. Lander, as well as a pre-Meathead Rob Reiner, this musical-hodgepodge is a colorful, exuberant, migraine-inducing blast, with producer-director (and future director of development for Norman Lear) Al Burton maintaining a frantic pace, dizzying camerawork, pseudo-groovy trappings, and a mindroasting array of performers... Hosted by PEYTON PLACE heartthrob Ryan O'Neal and (upcoming star of Disney's THE LOVE BUG) Michele Lee, viewers were promised a glimpse into the coolest new trends, only to undergo a hyperactive hour of background dancers cavorting about a trippy set, guest stars contractually obligated to look like they're having fun (poor 75-year-old Jimmy Durante enters via a children's playground slide, sporting a long-haired wig! ), loads of incredibly lame skits (like TIME TUNNEL star James Darren sampling "the next trend in food" and getting attacked by his KFC-esque "Octopus Delight Dinner" bucket), plus everyone acting so maniacally happy that you'd think someone dosed their craft services table. The show's musical choices are particularly egregious: Darren sings his sorta-hit "Goodbye Cruel World"; micro-skirted Barbara Eden warbles "Open a New Window" from Broadway's MAME (because today's kids adore stodgy show tunes); Michele performs "L. David Sloane" (a generic song from her '68 LP) to guys wearing cheap Alfred E. Newman masks; 67-year-old Sammy Davis, Sr. tap-dances to "Downtown"; Eden and Durante share a medley of moldy oldies, from Frankie Valli to Little Anthony and the Imperials; plus the justifiably-forgotten '60s band Harpers Bizarre plays poppy covers of "Chattanooga Choo Choo", Simon and Garfunkel's "The 59th Street Bridge Song" and Cole Porter's "Anything Goes". After all this dreck, it's a welcome treat when Cream pops up for "Sunshine of Your Love," only to have their segment spoiled by "comic" inserts with Steve Allen and Liberace. The hour also includes several filmed travelogue segments: a cruise ship packed with gratuitous bikinis; four freewheelin' chicks running about London, Paris and Rome in mod fashions; while the most wrongheaded clip follows several Japanese "birds" on an "Oriental romp" around Tokyo, with the obtrusive laughtrack erupting whenever narrator Durante stumbles over their Asian names. No question, its weirdest on-the-road "trend" is The Girlwagon, a huge, hippie-painted RV that allows you to "go where it's happening." Complete with dancing girls on its rooftop as it cruises down the highway and manned by actors Michael Blodgett (BEYOND THE VALLEY OF THE DOLLS) and 20-year-old Richard Dreyfuss (a UCLA friend of Rob Reiner's), this insane motorcoach was built by '60s Batmobile-creator George Barris. Including cameos by Joey Bishop, Sammy Davis, Jr. and B-actor-turned-pop-culture-punchline Sonny Tufts, ROMP!! is so wonderfully misguided that you can't help but gawk in amazement.